How did the Inka expand and control their empire? How did the Inka Road reflect the local environment? Who used the Inka Road? How did the Inka Road help feed the empire? How were food and supplies stored for the Inka empire? Where were Inka travelers housed? How did the Inka Road cross rivers? How did the Inka keep their suspension bridges safe? How did the Inka control water? How did the Inka control erosion and grow crops in the steep Andes terrain? 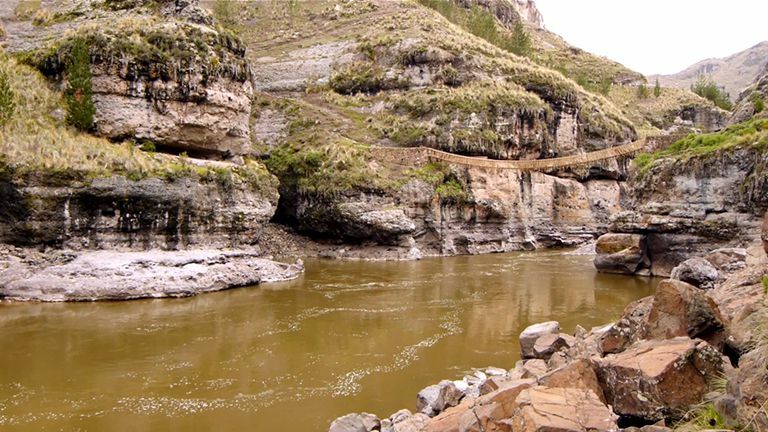 The Q'eswachaka bridge in Peru is rebuilt every year using traditional Inka engineering techniques by the local communities on either side of the canyon. This bridge has been continually rebuilt in this same location since the time of the Inka. The entire bridge is built in only three days. To construct the bridge, grass called q’oya is harvested and then prepared to be woven into large cables beginning with small cord which is twisted together from the local grass. These cords are then twisted to form a larger rope and the ropes are then braided to create the main cable. Up on the highway, the community works together to pull these ropes to stretch them out. These ropes are woven and twisted. Each rope is made from 30 of the small cords and then three of these ropes are braided to form the cables that will support the bridge. After more stretching, the cables are then carried down to where the bridge will be installed. The old bridge is used to run the first cable across for what will become the new bridge. And then the old bridge is cut down and it falls into the water and is washed away by the river. All day long, the community pulls on the new cables to prepare them for the bridge. These supporting cables are anchored to the stone abutments on either side of the canyon. The structure of the bridge is made with four cables for the floor and two handrails. The bridge weaving begins in the morning with Victoriano weaving from one side and another worker weaving from the other side until they meet in the center of the bridge. When the bridge is finally finished the communities come together to celebrate. The structure is remarkably safe. It has been built for centuries in this way and can hold dozens of people at any one time. Your session will expire in 30 seconds due to inactivity. Su sesión expirará en 30 segundos debido a inactividad.